Marvel’s Uncanny X-Men annual quenched many curiosities recently including the story of how Cyclops was raised from the dead. 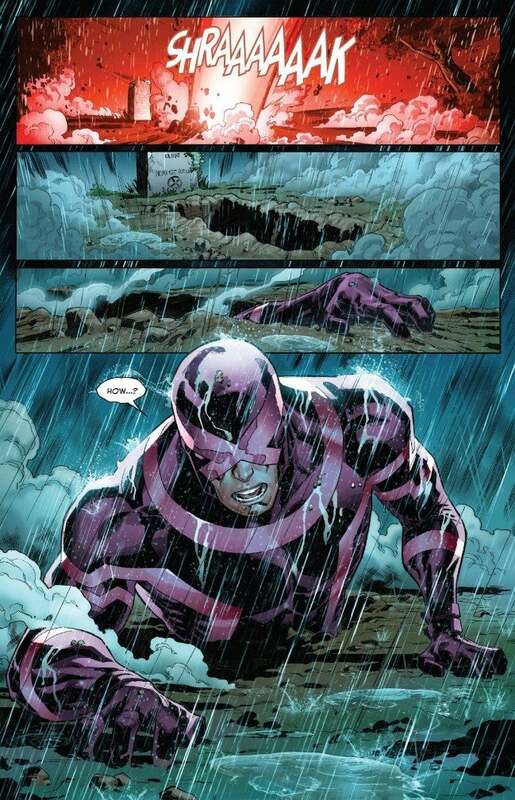 Starting off with the shot of Scott Summers’ grave, but an optic blast shattered the ground from within and out crawls Cyclops, confused as to whether or not he is dead. As Cable reveals to him, the key to his resurrection was reposed in the hands of someone he helped when he was young. The scene cut across to a school that Cyclops was walking by when a big robot started attacking it as well as the students. It is revealed this robot is puppeteered by a former professor who is locating the student that grassed him up and cost him his job. Cyclops takes the robot and the professor down and then runs into the student that Tierney was after. He tells him if he ever needs anything he just needs to ask, as his wife is expecting and he wouldn’t have a family without Cyclops. 10 years later we see Paul in his home, taking something out of the fridge. Paul is a really bright individual, even working for Stark eventually. The cable then asks him to take a broken Phoenix Cage and turn it into a device that isn’t trying to contain the Phoenix Force, but instead steal a bit of it and hold a charge, and it needs to be very small. Cable tells stipulated that he has two years and then leaves. Two years later Cyclops falls to the fogs, and Cable and Paul arrive at his funeral in secret. The two then find his body and implant the device into Scott’s chest and wait to see if it works. When Scott is brought back to life by the Phoenix Force in the Resurrection of Jean Grey to entice her to stay, Jean kisses Scott before letting him go, and during that embrace the device syphons off some of the Phoenix Force and keeps it, waiting for it to charge and activate. We get a flashback to Scott rising out of his grave, now back among the living, and we are ecstatic about the fact that our beloved X-man has been brought alive.